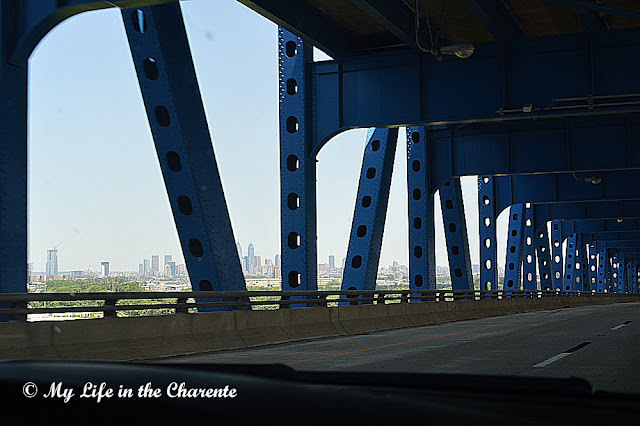 A distant view of Philadelphia city centre, as seen through the side of the Girard Point Bridge, which is a double-decker cantilever bridge carrying the trunk road Interstate 95 across the Schuylkill River. The bridge was opened in 1973 and carries three lanes of traffic across the river in each direction at each level. Viewing Philadelphia centre from a horse and carriage, one of many on offer for hire. Note the cobbled street! We became embroiled in a Gay Rights March, organised it appeared in support of the victims of the Orlando massacre a few days before. The police closed the whole city centre, so it proved almost impossible to find anywhere to park! The parade passed up and down the streets in which the main historical buildings are situated (this photo is of Market Street, the main street in the city) and the whole area was swarming with countless thousands of people! After taking the few photos below, we went back to the car and beat a hasty retreat out of town! 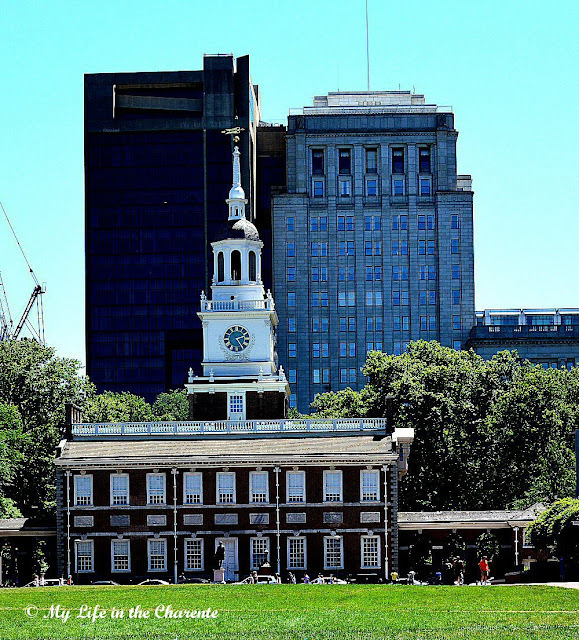 Independence Hall, now dwarfed by more modern buildings, is where both the Declaration of Independence and the Constitution were debated and adopted. 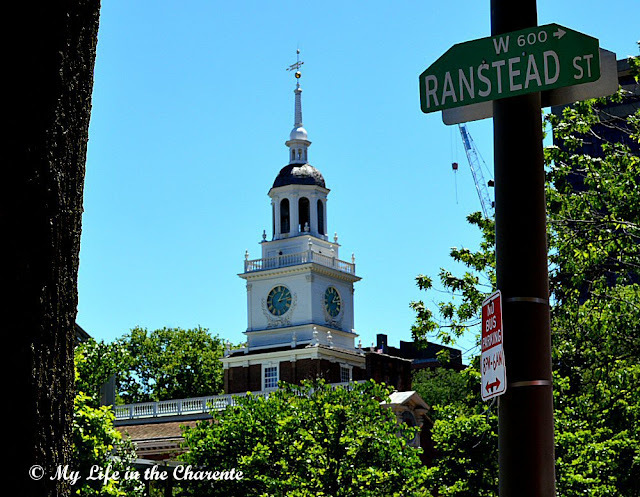 The Clock Tower of Independence Hall. The Religious Liberty statue, outside the National Museum of American Jewish History, shows a woman, symbolising liberty, shielding a boy with a lamp, representing religious faith. On the opposite side of the woman, is a carved eagle crushing a snake, a classic symbol of American democracy and representing the country's struggle against intolerance. 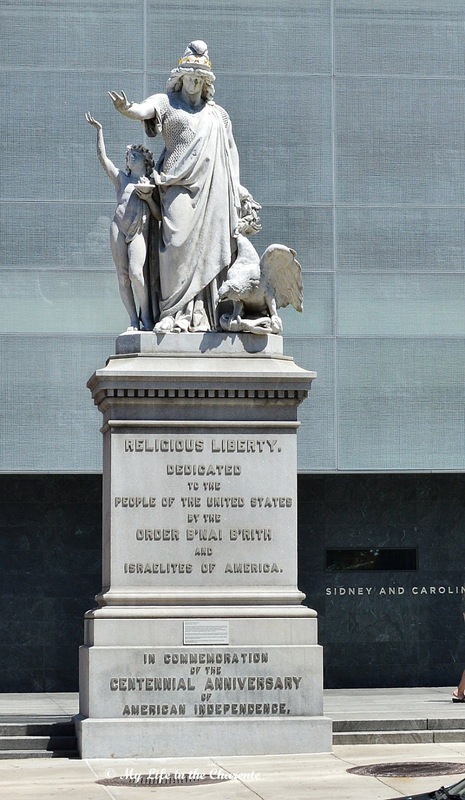 B'nai B'rith, a Jewish human-rights advocacy group founded in 1843, commissioned the sculpture and gave it to the American people for the Centennial celebration in Philadelphia in 1876. The American Civil War was effectively ended in June 1863 at the Battle of Gettysburg, after which General Lee of the Confederate Army (the South) surrendered to the Union (the North). 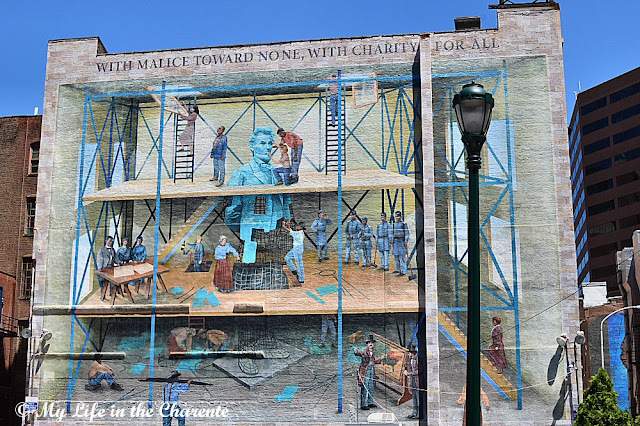 It was estimated over 25,000 men were killed on each side in this battle alone.This giant mural depicts the first few words of the closing paragraph of President Lincoln's subsequent "Gettysburg address". The entire closing paragraph of Lincoln's famously concise 273 word speech, for those unfamiliar with it, was delivered at the inauguration of the Gettysburg National Cemetery in late 1863 and is worth restating. 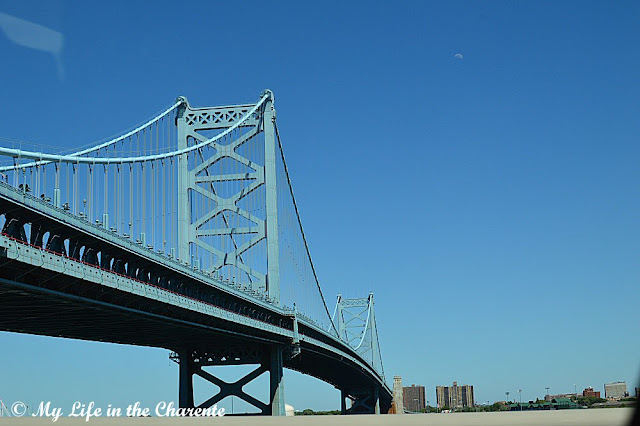 The Benjamin Franklin Bridge – originally named the Delaware River Bridge, and now informally called the Ben Franklin Bridge – is a suspension bridge across the Delaware River connecting Philadelphia in Pennsylvania, and Camden in New Jersey. 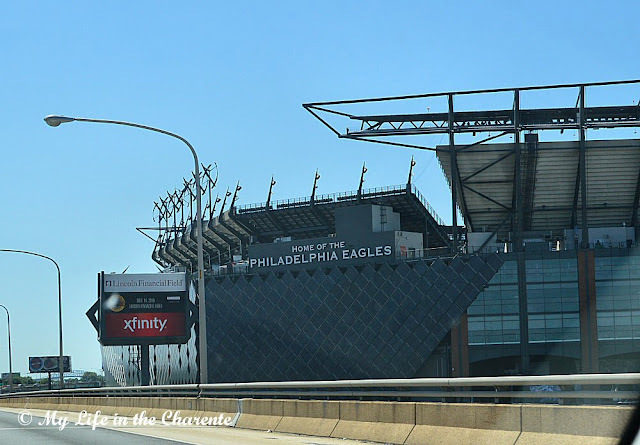 The Philadelphia Eagles are a professional American football (as opposed to soccer!) franchise based in Philadelphia. This is their very grand stadium, the size reflecting the enormous popularity of the game in the USA. and My Life Before Charente (updated 09 April 2016) I will get back to this eventually! Lovely photos and the mural is wonderful! You got some great photos Diane. It does look hot there though. I hope it isn't too hot to enjoy. I don't blame you for beating a hasty retreat from town with the demonstration going on. You never know what happens with tempers rising south of the border. Do enjoy your travels and do stay safe. May I be so bold as to suggest that a few people in the US need to read the top of that wall mural and have a bit of a think! Lovely photos, and interesting read. It looks like you got to see the central part of the city, and that's good, anyway. The Ben Franklin Bridge is free passing from Philly into New Jersey, but you have to pay $5 to leave New Jersey. We always joke that it's to keep everyone from just leaving New Jersey. 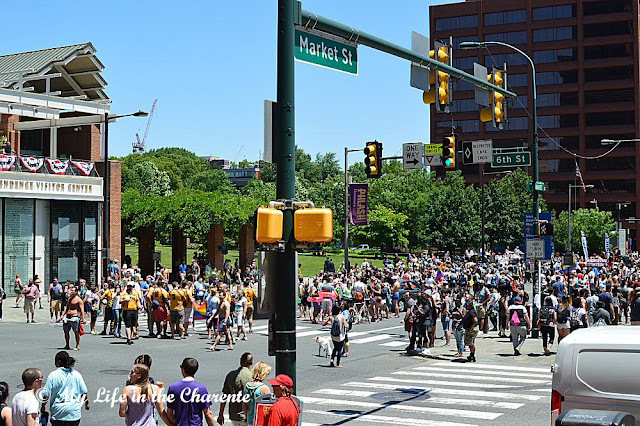 The crowds in Philly are usually pretty friendly, but I'm not a fan of crowds, either, and I never want to find out what is going to happen at a protest march anywhere. I'm glad you got to see a little of my part of the world, and, yes, even 90 degrees here is nothing compared to Nevada! 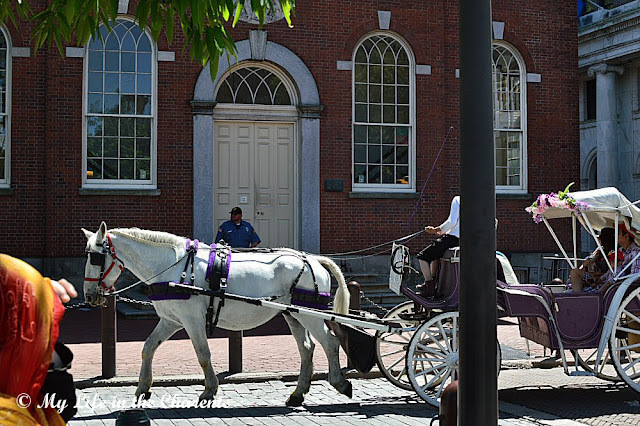 It's a great historical city to visit, Diane, but too bad about the turmoil during your visit. It's a crazy time in our country now and you were wise to move on. Happy sightseeing! It must have been a great trip... Was it your first visit to the US? Funny how I would flee now from large cities like Philly and propect the surrounding nature!! You had an interesting time in Philadelphia. I loved the old town best. There was scaffolding on Independence Hall so you were lucky to get such a good shot. This and your last post have been beautifully crafted, Diane. I'm looking forward to the subsequent installments - and wondering how many there will be!!! That Gettysburg address makes you realise what a great man Lincoln was. If only all would-be Pesidents of the USA had such wisdom, I'd have more hope for the future of that country, and the world!! Karroo, did you mention Karroo??? When are we going?? LOL! Seriously, if you have an opportunity, I'll be gladly part of the trip !!!! Super post...you had a lovely time, didn't you! Glad you got to see some of the city. Seems you know more about American History now than I do.